The Howick hills are well and truly humming with The Sound of Music. The upcoming production at the Harlequin Theatre has more than 75 per cent of the cast from Howick and the surrounding area. Many of the younger cast attend local schools, including Bucklands Beach Primary and Intermediate, Cockle Bay Primary, and Beachlands Primary. “We are also appreciative of the children and parents travelling from as far away as Henderson High School, St Joesph’s School in Pukekohe and Green Bay High School to be in the show,” says club president, Dale Smith. Songyang Teng, a talented ex-Pakuranga College student, has assisted in gathering a talented group of local musicians from Pakuranga College, Botany Downs Secondary College and Macleans College for the orchestra. Behind the scenes, the cast and orchestra are supported by a local production team. 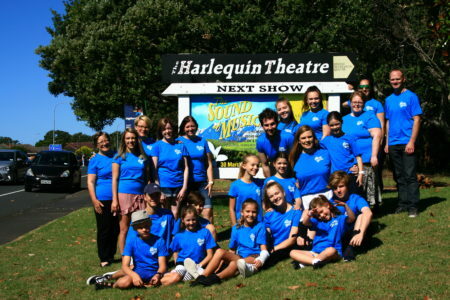 “As a not-for-profit community theatre, Harlequin could not survive without the many hours of time given by local volunteers and also the local businesses that provide support to the theatre. Harlequin uses local suppliers wherever possible to give back to the local community,” says Dale. Show Dates March 30 – April 13, including Sat/Sun matinees. Concessions available for seniors, students, children, Harlequin members and group bookings. Book now to join Harlequin Musical Theatre and the von Trapps for some of your favourite things!